Photo courtesy of Carol Niles Photography. This could go two ways. 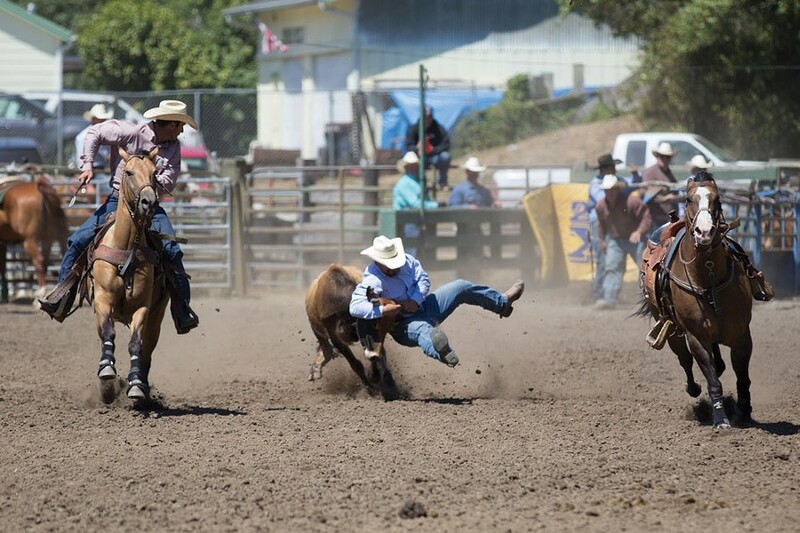 Pack up your banjo and head north to Blue Lake for the Humboldt Folklife Festival, or mozy south for Fortuna Rodeo Week. Wait, what kind of mileage do you get? Maybe you can hit both. The pickin' and fiddlin' in Blue Lake starts with a Kickoff on Saturday, July 12 at 6 p.m. at the Mad River Brewery with Clean Livin' and the Pilot Rock Ramblers. There's more music at Annie and Mary Day on Sunday (see page 39), rolling right into a week of genre shows in Dell'Arte's tent. Songwriter Night features Mo Morgan, Lemon Lemon Cherry and Joanne Rand on Monday, July 14 at 7:30 p.m. ($7, $5), and Jazz Night with Sound Judgement, La Musique Diabolique and RLA Trio is on Tuesday, July 15 at 7:30 p.m. ($7, $5). Old-Timey Night with Raising Grain, No Good Redwood Ramblers and Huckleberry Flint starts at 6 p.m. Wednesday, July 16 ($10, $8), and the rowdy Outlaw Country Night whoops it up with Gunsafe, Rooster McClintock and Cliff Dallas and the Death Valley Troubadours on Thursday, July 17 at 6 p.m. ($10, $8). If your brand of country includes actual brands, turn your boots toward Fortuna's Main Street for the chili cookoff at 5 p.m. on Monday, July 14 (free). You might oughta drink some milk first. Little cowboys and cowgirls can dress up and ride ponies during the children's games on Tuesday, July 15 at 6 p.m. and the street games, like the stick horse races and dummy roping on Wednesday, July 16 at 6 p.m. (free). The carnival lights come on Wednesday at noon and stay on through Sunday ($25 all-day wristbands). Thursday, July 17 brings Junior Rodeo starting at 9 a.m. at Rohner Park ($3, $1 kids 6-12) and buckets of fun at the Firemen's Games back on Main Street at 6:30 p.m. (free). Flip a coin — it'll be a good time either way.